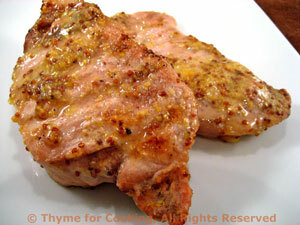 Grilled Pork Chops with Sweet Mustard Marinade, quick, easy gourmet recipes. We use orange marmalade through-out the summer in marinades and sauces for the barbecue. 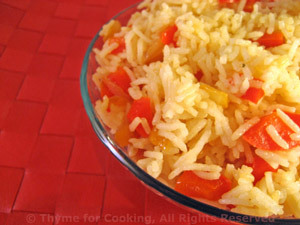 Fragrant Basmati rice, finished with sautéed red pepper, onion and garlic, makes a pretty side dish. Melt butter in a small saucepan over medium heat. Add rice and sauté, stirring for 1 - 2 minutes. Add onion, pepper, garlic and sauté until onion is tender. Remove from heat and keep warm until rice is done. When rice is done fluff with a fork, add onion, pepper, stir well to combine and serve. One doesn't often think of rosemary with beans but it's a lovely combination especially with the garlic chips. Peel garlic and slice as thinly as possible. Top and tail beans. Cut in 1 1/2" (4 cm) lengths or leave long if small. Put beans in a small skillet with stock, put on medium heat and bring to a boil. Turn down to low and simmer until done, 7 - 10 minutes. Heat oil in same pan. Add garlic slices and sauté. When garlic is just starting to color add rosemary. 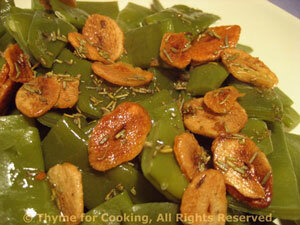 Continue to sauté until garlic is light brown - careful not to let it or the rosemary burn. Return beans to pan, stir to coat and reheat if necessary. Put back into serving bowl and serve.